Prokofieff draws on the whole extent of Rudolf Steiner's work and combines it with his own original spiritual research to form an intricate picture of the cosmic forces at play between Christmas and Epiphany. We are led on a tour through the circle of the zodiac and spiritual hierarchies, and shown how they form a path from Jesus to Christ. The author further explains that the Starry Script is a key to anthroposophical Christology, and shows how it relates to the conception of the First Goetheanum. Prokofieff guides us imaginatively through the interior of Steiner's architectural masterpiece, destroyed by fire in 1922, whose structure and decorations are seen to constitute a coherent esoteric map. Our task now, he suggests, is to build the First Goetheanum in ourselves and, through a new schooling of the self, strive for a truly modern path of initiation. Supplementary essays focus on the cosmic aspects of Sophia as well as the being of Michael. 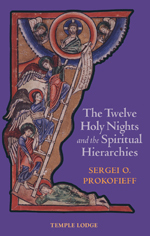 Prokofieff's seminal study offers a rich source of inspiration for those wishing to penetrate the mysteries of the Twelve Holy Nights and their relation to spiritual beings.